Current modern tablets and smartphones allow an effective data collection using internal sensors, onboard software and background maps. Integrated GPS receivers in these handhelds became a standard; the APP stores for all operation systems offer a large choice of mapping and GIS software solutions for any positioning application. But what about the accuracy? The positioning accuracy of integrated GNSS chips in smartphones or tablets can be sufficient for some applications but the reliability of a supposed 3-5 meter accuracy is very questionable. So, for any surveying job requiring a reliable accuracy, an external GNSS sensor is a must. The solution is to call a professional surveying company and pay for a precise positioning performed by “heavy equipment” or to do it on your own. This article would like to explain you that you can do it in a very smart way by an easy clicking of your tablet or phone to a precise GNSS receiver/sensor which serves as a mount of your PC. 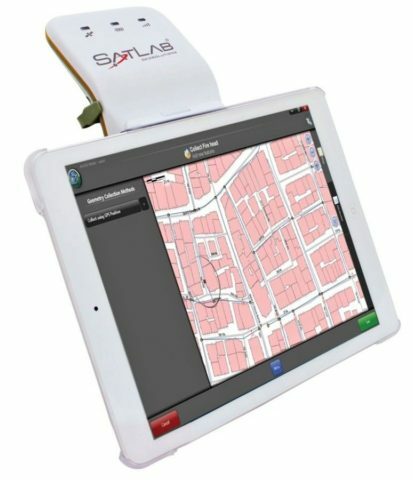 The Satlab SLC, manufactured by Swedish based Survey and GIS equipment maker Satlab Geosolutions AB, is a high precision GNSS RTK receiver sending cm level position NMEA data to the user’s tablet or phone. You can see it also as black box running a positioning application. The unique design includes a mounting plate for mounting the user’s device so it acts as the handheld’s display. No cable needed: the BlueTooth connection is sending all positioning data in high frequency rates to your device. Alternatively, the included USB/RS232 port can connect to your tablet and the you can also charge the SLC by the USB cable from your PC. With optional remote antenna and pole or fixed mount accessories, the SLC can be configured as a sensor for various machine control applications. There are different ways to obtain a positioning information from an external GNSS receiver. The easiest is the “Geolocation method”, available for practically any mapping software. The user simply activates the so called mock functionality on his/her iPhone or Android phone and makes sure that the phone is paired and connected to the external device. As soon as connection is achieved, the position from the phone is overwritten by the position from external GNSS receiver. Geolocation method, however, has limited number of attributes to represent location information like latitude, longitude, heading or speed. The user also does not obtain any data about the accuracy of his/her position: DOP values and especially the standard deviation information about positioning errors are missing. “NMEA parsing method” is a more complex approach, supported already by majority of professional surveying and GIS software. The NMEA protocol is sending all position relevant data to a terminal. Such data can be easily decoded and used by the application software, so that the user immediately sees his current positioning status. He/she just waits for a “green light” appearing on his screen at moment when there are sufficient healthy satellites and the position is RTK-fixed. Satlab SLC Toolbox is a simple software configuration tool running on Android or Windows. This software is used to define internet connection parameters, method of receiving GNSS correction signals and NMEA streams. It supports both above mentioned methods of providing positioning information and it is used just once to set up the users´ system. After the initial setup the user controls the SLC by his/her application software and can check the status by the control LED´s on receiver´s front panel.